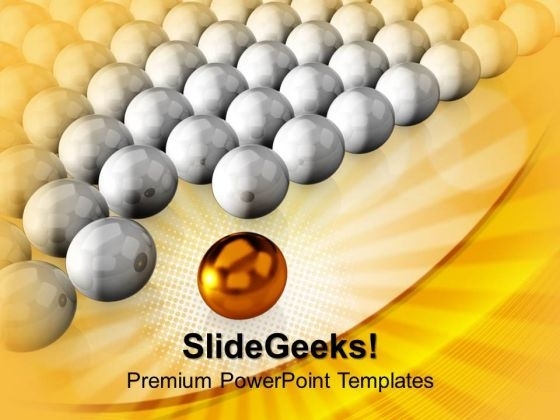 Golden Ball Leading Team PowerPoint Templates And PowerPoint Themes 1012-Create visually striking Microsoft office PPT Presentations with our above template consists of golden leader of business team. This image represents the concept of teamwork and leadership. This image has been conceived to enable you to emphatically communicate your ideas in your Business PPT presentations. It assumes individuality, team, uniqueness and success. The structure of our templates allows you to effectively highlight the key issues concerning the growth of your business.-Golden Ball Leading Team PowerPoint Templates And PowerPoint Themes 1012-This PowerPoint template can be used for presentations relating to-"Leadership concept on golden ball, communication, business, teamwork, success, spheres" Champion your favourite cause with our Golden Ball Leading Team PowerPoint Templates And PowerPoint Themes 1012. They give your argument added depth. Guide your team to victory with our Golden Ball Leading Team PowerPoint Templates And PowerPoint Themes 1012. Try us out and see what a difference our templates make.